Carrot Colada ... Simple and Refreshing! 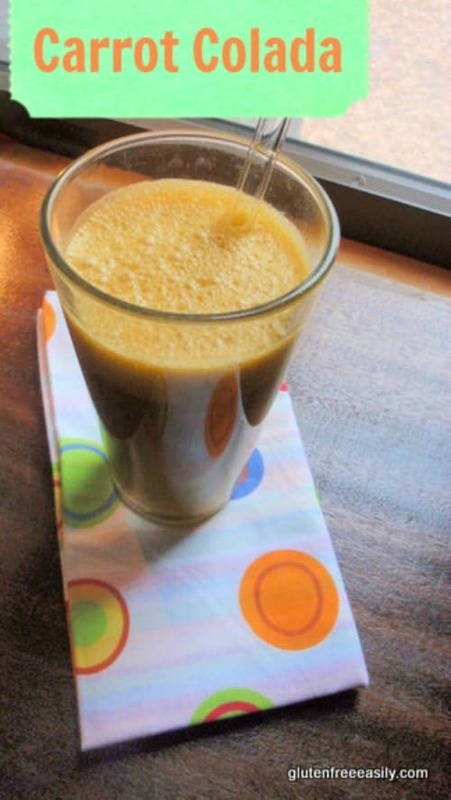 I first shared this wonderful Carrot Colada recipe over on my friend Ricki Heller’s blog. I’ve been a fan of Ricki’s for years and actually got to meet her “In Real Life” last summer—a major highlight! Ricki is a genius recipe creator. You can see all her cookbooks here (even her upcoming one!). Her last one was Naturally Sweet and Gluten Free: Allergy-Friendly Vegan Desserts: 100 Recipes Without Gluten, Dairy, Eggs, or Refined Sugar (which I reviewed and shared a recipe from here). It’s a bestseller, and for good reason! Back to this Carrot Colada … I am all about simple and delicious recipes. Those recipes are the essence of my gluten free easily … aka gfe …approach, which some might call too easy or borrrring … or simply lazy. That remark resembles me! Haha! Thanks to Anthony Douglas Williams for that one, and I really think this wisdom can be true for food and life in general. Most often, I love simple recipes that are made with real food, whole food that I have on hand. This Carrot Colada that I’m sharing today qualifies. I don’t have a juicer because I am pretty sure that I’d consume more of the sweet juices than I’d need, but occasionally I purchase fresh carrot juice and add it to my smoothies. (And I also love it when friends with juicers come for extended visits and we juice daily!) Carrots are healthy and naturally sweet, of course, and carrot juice brings those factors plus such a lovely orange color to smoothies. With this Carrot Colada, I added just a few other ingredients that I always have in my refrigerator, freezer, and pantry. That would be bananas, coconut milk, and baby spinach. That last one, baby spinach, might surprise you. You know that it’s great for salads and has terrific nutritional value, of course. But baby spinach also works great in blended drinks and even amazing ice cream because of its mild flavor, which is completely unnoticeable when mixed with other ingredients. As far as the other two ingredients, I won’t tell you how many bananas are in my freezer right now. I’m a self-professed (or is it self confessed?) banana hoarder and I need to go on a banana binge soon to clear them out! Coconut milk is my favorite non-dairy milk. (I like to order Natural Value organic coconut milk because it’s gum free and BPA free, but I also like this brand, which also has a “free” version.) Bottom line: This Carrot Colada is so simple yet so satisfying and good for you! Incidentally, if you’re a big fan of pineapple in your coladas—as in pina coladas—you can certainly add some to this recipe (I’d skip the rum though, especially in the a.m.—hehe! ), but this Carrot Colada is plenty sweet “as is” and offers you enough of a tropical vibe with only the bananas and coconut milk. This Carrot Colada is a terrific way to start one's day. Only four ingredients and naturally paleo and vegan. What a creative way to get veggies in! Hey Tracey–It takes 8 carrots to yield 1 cup of juice when juicing. This recipe calls for 2 cups of juice. Since you’re using the whole carrot, you might start out with 4 carrots and be prepared to add more carrots and more water or coconut milk to get both a carrot flavor and enough liquid. I can’t say for sure that method will work, but if you play around with amounts (and make note of them) to get the right consistency and flavor, it should. Good luck and let us know what you figure out! I’ve finally found time to post my carrot colada experiment…..
My final “brew” consisted of 2 whole carrots (200g), 1 cup coconut milk, 1 cup ice, and 1 frozen banana (95g). I blended the whole thing in a high powered blender. This version tasted pretty good, but when I did another version with 1/2c spinach added, it went a murky brown colour. Although it still tasted ‘ok’, the colour played with my mind & I won’t make it that way again. Ricki–Yikes, I read your comment while on vacation and then forgot to reply later. 🙁 Thanks, dear! I could go for one of these right now and I was so honored to guest post on your blog! Happy Friday! Yum! A refreshing virgin drink, just what I need!